This article is about the band. For other uses, see 311 (disambiguation). "P-Nut" redirects here. For the actual food, see Peanut. 311 (pronounced "three-eleven") is an American rock band from Omaha, Nebraska. The band was formed in 1988 by vocalist and guitarist Nick Hexum, lead guitarist Jim Watson (a member briefly, before being replaced by Tim Mahoney in 1990), bassist Aaron "P-Nut" Wills, and drummer Chad Sexton. In 1992, Doug "SA" Martinez joined to sing and provide turntables for 311's later albums. 311 performing in Austin, Texas, on August 14, 2011. 311 has released twelve studio albums, two live albums, four compilation albums, four EPs and four DVDs. After a series of independent releases, 311 was signed to Capricorn Records in 1992 and released the albums Music (1993) and Grassroots (1994) to moderate success. They achieved greater success with their 1995 triple platinum self-titled album, which reached number 12 on the Billboard 200 on the strength of the singles "Down" and "All Mixed Up", the former of which topped the Billboard Hot Modern Rock Tracks in 1996. The band's next three albums—Transistor (1997), Soundsystem (1999) and From Chaos (2001)—were also successful, with the first going platinum and the last two going gold. Their 2004 compilation album Greatest Hits '93–'03 was also certified platinum. The band's most recent studio album is 2017's Mosaic. As of 2011, 311 has sold over 8.5 million records in the United States. The band's name originates from the police code for indecent exposure in Omaha, Nebraska, after the original guitarist for the band was arrested for streaking. 311's first independent release was the Downstairs EP, which was recorded in 1989 in Nick Hexum's basement. Unlike many of their releases, it had no cover art. It features the song "Feels So Good," which was recreated/remastered in the album Music, and a staple of most of 311's live shows. In 1990, 311 produced their second independent release, Dammit!, recorded at IEV Studios in Papillion, Nebraska. In 1991, Tim Mahoney replaced Jim Watson on guitar and 311 released their third independent release, Unity, recorded at Rainbow Recording Studios in Omaha, which was released with greater numbers than Dammit!. While Dammit! only printed 300 cassettes, Unity had 1000 CDs and 500 cassettes printed and was distributed through consignment and also sold at shows. The band began to headline shows in local clubs, such as The Ranch Bowl and Sokol Auditorium. In 1992, S.A. Martinez, who had been making various appearances with 311 over the past years as a vocalist, was officially asked to join the band. 311 recorded a six-track demo, called Hydroponic, also recorded at Rainbow Recording Studios, and moved to Los Angeles. Within their first few months, 311 was signed to Capricorn Records. 311 considers their first show to be held on June 10, 1990, opening for Fugazi in Omaha, Nebraska, at the Sokol Auditorium. Their first major record, Music was released in 1993. The single "Do You Right" received airplay on modern rock stations and reached No. 27 on Billboard's Modern Rock Tracks chart. However, the album failed to chart at the time. Also notable, the album was produced by Eddie Offord, who famously produced Yes and Emerson, Lake & Palmer. Financing their own tour, the band drove around in an old RV borrowed from Sexton's father, and towed a Volkswagen bus which held their equipment. After tackling a steep incline while en route to an Omaha show, the RV caught fire. The only door out of the vehicle was surrounded by flames so the band jumped through the fire. All of their equipment and possessions were lost, though no one was seriously injured. The band continued their tour, using borrowed equipment. The following year, they released their second studio album, Grassroots. In 1995, 311 released the self-titled 311 (also known as The Blue Album). Produced by Ron St. Germain, the album was recorded live in contrast to their previous two albums in which all instruments were recorded separately. The first single "Don't Stay Home" was a modest success, reaching No. 29 on Billboard's Modern Rock Tracks chart. But the follow-up single "Down", which was released 14 months after the album, received heavy airplay on mainstream radio, and the accompanying music video was on MTV's rotation. The song hit No. 1 on the Modern Rock chart. The band made their network television debut on Late Night with Conan O'Brien on August 23. The third single, "All Mixed Up", enjoyed almost identical success, reaching No. 4 on the Modern Rock chart. They also appeared on Late Show with David Letterman playing "Down". In the following years, 311 continued touring and on August 5, 1997, they released Transistor which debuted at No. 4 on the Billboard 200, their highest position on that chart. The album went platinum. In 1998, 311 released Live, a live album from a 1997 performance in New Orleans, Louisiana. 311 also released Omaha Sessions, a compilation album from their early independent releases. In 1999, 311 released their fifth major album, Soundsystem. The song "Come Original" reached No. 6 on Billboard's Modern Rock Tracks chart. The second single, "Flowing", had American Pie's Eddie Kaye Thomas featured in the music video. In 1995, the band purchased a recording studio in North Hollywood, California, called The Hive. The band has recorded every album at The Hive since 2000, beginning with the sessions for From Chaos, 311's sixth major record release. From Chaos was released in late 2001. Its first single, "You Wouldn't Believe" featured basketball star Shaquille O'Neal in the video. Their seventh major release, Evolver (Produced By Ron Saint Germain), came in 2003. In Summer 2003, 311 launched their inaugural Unity Tour. The tour included openers G. Love & Special Sauce, O.A.R. and Something Corporate. In 2004, 311 covered The Cure's "Love Song" which became a No. 1 hit on the Modern Rock Tracks chart. It also reached No. 59 on the Billboard Hot 100, their first single to reach that chart. It was featured on the soundtrack for the motion picture 50 First Dates and then a few months later on their own Greatest Hits '93-'03. The compilation featured two new songs: "How Do You Feel?" and "First Straw". In Summer 2004, 311 kicked off their second annual Unity Tour with openers The Roots and Medeski Martin & Wood. On August 16, 2005, 311 released their eighth studio album, titled Don't Tread on Me. "Don't Tread On Me", the first single, reached No. 2 on the Billboard Modern Rock chart and No. 7 at Bubbling Under Hot 100 Singles. In Summer 2005, 311 kicked off their third annual Unity Tour with openers Papa Roach and Unwritten Law. On July 20, 2006, 311 kicked off their Summer Unity Tour, playing 37 shows in 27 states and featuring opening bands Pepper and Wailers. After completion of the tour, 311 announced they would be taking a break, their first official one in over eight years. In January 2007, 311 stepped back into their Hive Studios with Nick's younger brother Zack Hexum. They recorded a cover of Toots & the Maytals song "Reggae Got Soul" for the soundtrack from the film Surf's Up, which was released on June 5, 2007. 311 is also one of bands that have been able to successfully tour "off-cycle", headlining amphitheaters each summer. Their Summer Unity Tour in 2007 included supporting acts Matisyahu and The English Beat. In 2008, they featured opening acts Snoop Dogg and Fiction Plane. In 2009, they had another Summer Unity Tour which featured opening acts Ziggy Marley and The Expendables while in 2010, supporting act The Offspring and opening act Pepper were featured. In 2011, Sublime With Rome and DJ Soulman & DJ Trichrome were the openers on the Unity Tour. Uplifter, 311's ninth studio album, was released on June 2, 2009. The album, produced at 311's Hive Recording Studios in Los Angeles by Bob Rock, debuted at No. 3 on the Billboard 200, the band's highest chart position in the U.S. to date. The band followed up the release of the album with tours in Summer and Fall 2009. 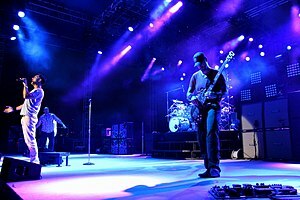 They have completed their Spring 2010 tour, which included 311 Day 2010, held in Las Vegas, Nevada. A Summer tour with The Offspring began in June 2010. 311 also held a 2010 fall tour. In early 2011, 311 finished recording their tenth studio album called Universal Pulse at the Hive in Los Angeles, with producer Bob Rock. The album was released July 19, 2011. The album's first single, "Sunset in July" was released on June 3, 2011. Universal Pulse is their shortest album yet, only having 8 songs. In Summer 2012, 311 embarked on their tenth annual Unity Tour with Slightly Stoopid, SOJA, and The Aggrolites. On August 24, 2012, Doug "SA" Martinez told Phoenix's Up on the Sun that an eleventh 311 studio album was in the works and planned for release in 2013. However, on July 15, 2013, their eleventh album was announced to be released on March 11, 2014, to coincide with 311 Day 2014. According to P-Nut, the album is to have "darker themes", and was produced by Scotch Ralston. On July 2, 2013, 311 started their eleventh annual Unity Tour with Cypress Hill and G. Love & Special Sauce. The tour ended on August 4, 2013. Stereolithic, the band's first independently released studio album since 1991's Unity, was released on March 11, 2014. On November 18, 2014, 311 released a live album, 311 with the Unity Orchestra – Live from New Orleans – 311 Day 2014. The album documents part of the 311 Day 2014 concert wherein the band was accompanied onstage by a symphony orchestra for nine songs. 311 Archive, a four disc compilation album featuring 81 previously unreleased songs, b-sides and demos, was released on June 30, 2015. As of February 2016, according to Nick Hexum, 311 was working on a new album, and in February 2017, the band revealed the new album's title, Mosaic, on their PledgeMusic update feed. Six song titles were released to the public, "Hey Yo", "Island Sun", "Extension", "Too Much to Think", "Syntax Error", and "Too Late"; with the first two being debuted at 311 Day 2016. 311 invited their fan base to submit a photo of themselves to be featured on the album artwork. Mosaic was released on June 23, 2017, and was met with positive reviews. It was their 12th studio album and their 10th consecutive to debut in the Top 10 of US Billboard 200. It debuted at number six, with 39,000 album-equivalent units, of which 37,000 were pure album sales. On March 9, 2017, the band released "Too Much to Think", the first single from Mosaic. Following that, 311 released singles "Too Late" and "Perfect Mistake"
In 2018, 311 and The Offspring toured together on the Never-Ending Summer tour. That summer, The Offspring released a cover of 311's "Down" and 311 released a "reggaefied" cover of The Offspring's "Self Esteem". Hexum states that 311 has "the bulk of an album written" and is working with producer/co-writer John Feldmann of Goldfinger on some tracks. Later that summer, Mahoney confirmed that they were working with both Scotch Ralston and John Feldmann on Voyager. 311 will release Voyager on June 28, 2019. The documentary, Enlarged To Show Detail 3 was released to theaters for one day only on March 11, 2019. On March 11, 2000, 311 began celebrating an unofficial holiday of their own creation, which they called 311 Day. The band chose the date because March 11 is written in the United States as 3/11. Every other year on March 11, the band performs an extended concert for thousands of their fans. In 2000, the band played 47 songs. In 2002, they increased the set list to 59 songs. In 2004, 311 played 68 songs. The band played entire albums, rarities and covers. Later that year, a DVD was released of the performance that contained 64 of the 68 songs. 311 Day in 2006 was held at the Mid-South Coliseum in Memphis, Tennessee, where the band played 65 songs. The intended set list was cut short from 69 songs because of a strict midnight curfew. The band recorded the entire show in high definition,and a 2-hour edit of the show aired on HDTV on December 10. In 2008, 311 Day was held in the New Orleans Arena in New Orleans, Louisiana. Over three separate sets, the band played 63 songs to a sold-out crowd of 14,000 fans, who represented all 50 states and 13 countries. In 2010, 311 Day took place at the Mandalay Bay Events Center in Las Vegas, Nevada. All 60 songs, 32 of which were different from 311 Day in 2008, were broadcast live on the web in a video on demand format described as a "professional multi-camera HD production." In 2012, 311 Day took place at the MGM Grand Garden Arena in Las Vegas and, for the first time, was split into two days. The band performed 79 songs during the two-day concert. On July 3, 2013, the band announced at the Unity Tour show in Chicago that 311 Day 2014 would be returning to New Orleans. 311 Day 2016 took place in New Orleans, at the Smoothie King Center (New Orleans Arena) on 3/11/2016 & 3/12/2016. 311 Day 2018 took place on 3/10 and 3/11 in Las Vegas at the Park Theatre at the Monte Carlo Resort & Casino. 86 songs were played, including a cover of Pink Floyd's "Wish You Were Here" with a In Memoriam video tribute to late musicians and 311 fans Renee O'Neal, Meredith Hight, and Nick Hexum's youngest brother Patrick. In March 2011, 311 began hosting a Festival Cruise. The environment is similar to an outdoor music festival involving camping. The 2011 Caribbean Festival Cruise departed on 3/3/2011 from Miami, FL aboard Norwegian Pearl for Grand Turk, Turk and Caicos. The festival cruise featured three shows, over four days leaving from Miami to Turks and Caicos, and featured guest bands: The Movement, DJ Soulman and Nocturnal Arts, Full Service, Pepper and The Expendables. On May 10, 2012 311 hosted their second Caribbean Festival Cruise on the Norwegian Pearl, departing from Miami and landing on a private island, Half Moon Cay, in the Bahamas for three consecutive nights and featured guest bands including: The Dirty Heads, Shwayze, 2 Skinnee J's, DJ Soulman, Outlaw Nation, Shootyz Groove, BALLYHOO!, Passafire, Cisco, Full Service, DJ Trichrome, Exes Of Evil, Trailer Park Ninjas, Moral Defect among others. 311's 2015 Caribbean Festival departed from Miami on February 25, 2015 aboard the Norwegian Pearl. It made port in Jamaica. The line up included 311 with three sets, Dirty Heads, Pepper, Chali 2na, RX Bandits, The Green, RDGLDGRN, Full Service, The Funk Hunters, Doug Benson, DJ Soulman, J Randy, Andy Haynes, Papafish, Beatcake, Singles, Tony Hinchcliffe, DJ Native Wayne, DJ Trichrome, The Unity All Stars, Headphone Disco among others. 2017 marked the fifth 311 Caribbean Cruise! Departed from Tampa to Cozumel, March 2–6, 2017, on board the Norwegian Jade. Lineup of bands, DJs and comedians, including Rebelution, Reel Big Fish, Stick Figure, People Under the Stairs, Ballyhoo!, RDGLDGRN, Los Stellarians (side project of 311 member SA Martinez) and ILL Communication. The band headlined set lists as usual and hosted other bands as well. 311 played their hit songs plus debuting two new tracks; "Extension" and "Too Late" while also covering Prince's "Let's Go Crazy". 311 hosted their first "Pow Wow" Festival from August 4 to August 6, 2011, at the Spirit of the Suwannee Music Park in Live Oak, FL. Along with 311, it featured DJ Trichome, Murs, SOJA, Deftones, DJ Soulman, The Movement, Full Service, Streetlight Manifesto, The Dirty Heads, Sublime with Rome, Shinobi Ninja, Ballyhoo!, The Supervillains, Ozomatli, G. Love & Special Sauce, and comedians Doug Benson and Graham Elwood. Along with fire performances by Nocturnal Arts. 311 played four sets and the album Transistor in its entirety. 311's music is a blend of rock, reggae, hip hop and funk. 311 has been described as alternative rock, reggae rock, rap rock, funk metal, funk rock, rap metal, post-grunge, alternative metal and nu metal. 311's influences include The Clash, The Cure, Descendents, Red Hot Chili Peppers, Cypress Hill, De La Soul, A Tribe Called Quest, Led Zeppelin, Bob Marley, Fishbone, and Bad Brains. Ward Bones – keyboards and backup vocals on Unity (311) Omaha and Los Angeles "Big Time" including co-writing "Independence Day" on Unity Los Angeles demo. Black Chiney – back-up vocals on "Creatures (For Awhile)", specifically, the "Watch it Now" sample"
Daddy Freddy – back-up vocals on "Nix Hex"
Robert Greenridge – steel drums on the song "Speak Easy"
Adam Merrin – piano on "Too Much Too Fast"
Zack Hexum – Nick's younger brother, plays saxophone in "Outside" a 311 B-side. He also plays the horns on 311's cover of the Toots & the Maytals song "Reggae Got Soul", recorded for the Surf's Up movie soundtrack. Marcus Watkins – guest guitar on the version of "Fat Chance" on Dammit! ^ Barrett, John. "The 20 Most Underrated Bass Guitarists". Paste Monthly. Retrieved 4 April 2016. ^ a b "RIAA certifications". Archived from the original on 2013-02-25. Retrieved 2011-04-27. ^ "311 Album & Songs Chart History: Alternative Songs". Billboard. Prometheus Global Media. Archived from the original on 1 May 2011. Retrieved 2011-04-27. ^ "311". Red Light Management. Archived from the original on 2011-06-21. Retrieved 2011-04-27. ^ "How 311 Got Its Name". snopes.com. Retrieved 2012-07-18. ^ "311 Press Pack". 311.com. Retrieved 2011-09-11. ^ Alternative Songs (1993-04-17). "Do You Right – 311". Billboard.com. Retrieved 2011-09-25. ^ Alternative Songs (1995-11-11). "Don't Stay Home – 311". Billboard.com. Retrieved 2011-09-25. ^ a b c "311 – Chart history". Billboard. 2004-08-14. Retrieved 2017-06-25. ^ Billboard. "Transistor – 311". Billboard.com. ^ "Recording Industry Association of America". RIAA. Archived from the original on 2013-02-25. Retrieved 2012-07-09. ^ 311. "311 – Awards". AllMusic. Retrieved 2012-07-09. ^ "311". Billboard. Retrieved 29 February 2016. ^ Reitz, Allison (2009-03-13). "311 tour announces Summer Unity dates for 2009 with Ziggy Marley". TicketNews. Retrieved 2017-06-25. ^ "Official website of 311". 311music.com. Retrieved 2011-10-26. ^ "311 – 7.8.11 – Capitol Federal Park at Sandstone". 965thebuzz.com. 2009-01-06. Archived from the original on 2011-09-27. Retrieved 2011-10-26. ^ Caulfield, Keith (June 10, 2009). "Dave Matthews' 'Big' Debuts At No. 1 On Billboard 200". Billboard. Retrieved 2009-06-11. ^ "EXCLUSIVE: 311 Debut Funky New Single". SPIN.com. 2011-06-03. Retrieved 2011-09-11. ^ "311's Doug "SA" Martinez Discusses the Band's Fans". Up on the Sun. 2012-08-24. Retrieved 2012-09-26. ^ "311's Doug "SA" Martinez Discusses the Band's Fans (page 2)". Up on the Sun. 2012-08-24. Retrieved 2012-09-26. ^ "311 NEWS (7/15/13)". 311.com. Retrieved 2013-07-31. ^ Kyle Susalla (2013-06-09). "Even after 24 years of rocking stages, 311 still producing their unique blend of music styles – Heritagewest – Heritage Newspapers". Heritage.com. Archived from the original on 2013-07-31. Retrieved 2013-07-31. ^ "311, Cypress Hill + G Love & Special Sauce Join Forces for Unity Tour 2013 @ARTISTdirect". Artistdirect.com. Retrieved 2013-07-07. ^ "311 Going Indie for March Album (exclusive)". Billboard. 16 December 2013. Retrieved 17 September 2014. ^ "iTunes – Music – With the Unity Orchestra – Live from New Orleans – 311 Day 2014 by 311". iTunes. Retrieved March 27, 2015. ^ "311 Celebrate 25th Anniversary With 81-Track Box Set". June 2, 2015. Retrieved July 1, 2015. ^ Brian Blueskye. "Innovative Omahans: After 11 Successful Studio Albums, 311—Headlining the Rhythm, Wine and Brews Experience—Preps for a 12th". Retrieved 29 February 2016. ^ "Reggae-rock hybrid act 311 joingint Matisyahu at Jacobs Pavilion". News-herald.com. Retrieved 2017-06-25. ^ Caulfield, Keith (July 2, 2017). "DJ Khaled's 'Grateful' Debuts at No. 1 on Billboard 200 Albums Chart". Billboard. Retrieved July 3, 2017. ^ "311 – Too Much To Think (Lyric Video)". YouTube. 2017-03-09. Retrieved 2017-06-25. ^ "311 – Too Late". YouTube. 2017-04-13. Retrieved 2017-06-25. ^ "311 – Perfect Mistake [Audio". YouTube. 2017-06-08. Retrieved 2017-06-25. ^ "311 to host fifth Caribbean cruise in 2017". Retrieved May 14, 2018. ^ "311 and the Offspring Recorded New Versions of Each Other's Material: Exclusive". July 19, 2018. Retrieved July 19, 2018. ^ "Interview: Tim Mahoney – 311". August 14, 2018. Retrieved August 15, 2018. ^ "311 returns to Siouxland for summer concert (FULL INTERVIEW)". August 30, 2018. Retrieved October 17, 2018. ^ "Sen Dog & P-Nut on Getting Doug with High". October 9, 2018. Retrieved October 17, 2018. ^ "Nick Hexum of 311 speaks with KRYZ, The Scene (Nov 2018)". November 8, 2018. Retrieved November 11, 2018. ^ a b "Happy 311 Day! – Thursday, March 11, 2010 | 11:53 a.m." Las Vegas Sun. Retrieved 2012-07-13. ^ a b "311 Day 2012: Live in Las Vegas « The Pier Magazine". Thepier.org. 2011-09-17. Retrieved 2012-07-13. ^ "311 Day 2010". Setlist.com. 2010-03-11. Retrieved 2011-10-26. ^ "DAY 2016 INFO PAGE | 311 | Official Site". 311. 2016-03-12. Retrieved 2017-06-25. ^ "KEY DATES IN 311 HISTORY – 311 – Official Site". www.311.com. ^ "311 NEWS (3/13/12)". 311.com. Retrieved 2013-03-24. ^ a b c Sixthman. "311 Caribbean Cruise". ^ "311 Caribbean Cruise 2013 | March 1-5, 2013". 311cruise.com. Retrieved 2013-03-24. ^ "311's Caribbean Cruise to Jamaica". The Pier Magazine. ^ "2015 Cruise for 311". cruisemates.com. ^ "311: 311 – What's Next?!". 311.fanbridge.com. Retrieved 2017-06-25. ^ "311: MOSAIC on PledgeMusic". Pledgemusic.com. Retrieved 2017-06-25. ^ "311 Caribbean Cruise – March 2-6, 2017". 311cruise.com. Retrieved 2017-06-25. ^ "311 Pow Wow Festival This Week! « The Pier Magazine". Thepier.org. 2011-08-03. Retrieved 2012-07-18. ^ "311". Rock Brothers Brewing. 2014-06-20. Retrieved 2017-06-25. ^ "AMBER ALE | 311 | Official Site". 311. Retrieved 2017-06-25. ^ "Grassroots Uplifter". Grassroots Uplifter. 2016-04-11. Retrieved 2017-06-25. ^ "Rock Band 311 & BK Racing Partner for the 2015 NASCAR Sprint Cup Season". BK Racing. Retrieved 2017-06-25. ^ "311 and Snoop Unite for Summer Tour – antiMUSIC News". Retrieved 17 September 2014. ^ Fran Golden. "Rock band 311 to host concert cruise on Norwegian Pearl". Retrieved 17 September 2014. ^ V, Jonny (April 9, 2018). "Battery Park adds another act, 311 and The Offspring". Hot 104.7. Retrieved April 24, 2018. ^ Frank, Annalise (July 25, 2017). "Rock-reggae band 311 to headline 20th annual Arts, Beats & Eats". Crain's Detroit Business. Retrieved April 24, 2018. ^ "311, Matisyahu anchor a night of reggae in Irvine – The Orange County Register". The Orange County Register. Retrieved 17 September 2014. ^ Thompson, Stephen (March 29, 2002). "311: Transistor". The A.V. Club. Retrieved April 24, 2018. ^ Zimmerman, Ashley (March 25, 2015). "Nick Hexum of 311 on Fatherhood, Staying Together, and SunFest". New Times Broward-Palm Beach. Retrieved April 24, 2018. ^ Lewis, Randy (September 9, 2002). "Balance Is Elusive at the Liquid Mix Festival". Los Angeles Times. Retrieved April 24, 2018. ^ "311: Live and Loving It". Yahoo! News. July 10, 2014. Retrieved April 24, 2018. ^ Raible, Allan (March 16, 2014). "Record Release Rundown: The Latest From 311, Elbow, Ledisi, Aloe Blacc and More". ABC News. Retrieved April 24, 2018. ^ "Sound Check: New Concerts in Connecticut and Western Massachusetts – Hartford Courant". Hartford Courant. Retrieved 17 September 2014. ^ Chris Kies March 14, 2014 (2014-03-14). "Tim Mahoney: 311 Comes Full Circle". Premier Guitar. Retrieved 2017-06-25. ^ "How Bad Brains Created the Best Funk Metal Album 30 Years Ago". VICE. Retrieved 2017-06-25. ^ "Blunt-Force Trauma". Washingtoncitypaper.com. 1996-02-16. Retrieved 2017-06-25. ^ "311 Planning Extensive Fall Tour". Billboard. August 13, 2001. Retrieved April 24, 2018. ^ Moss, Kyle (October 6, 1999). "311 'come original' on 'Soundsystem'". Iowa State Daily. Retrieved April 24, 2018. ^ "Utah Local News – Salt Lake City News, Sports, Archive – The Salt Lake Tribune". Archived from the original on 2015-07-16. Retrieved 17 September 2014. ^ Hyden, Steven (March 13, 2014). "Escape From Pop Purgatory: 311 Has Not Changed Since You Were in Middle School". Grantland. Retrieved April 24, 2018. ^ Leicht, Angelica (July 12, 2013). "The 10 Lamest Bands of the '90s". Houston Press. Retrieved April 24, 2018. ^ "10 Things To Do This Week". lehighvalleylive.com. Retrieved 17 September 2014. ^ Colurso, Mary (1 May 2009). "311's big hit is 'Down' but band wants to be 'Uplifter' at Birmingham's Crawfish Boil". AL.com. Retrieved 11 December 2015. ^ Nixon, Chris (August 16, 2007). "'Anything goes'". The San Diego Union-Tribune. Archived from the original on February 14, 2011. Retrieved April 24, 2018. ^ "Cholo Soul | Holy Grailien". Holygrailien.bandcamp.com. Retrieved 2017-06-25. ^ "311 Evolver Wiki". last.fm. last.fm. Retrieved 1 April 2018.